With one of the broadest portfolios and largest number of advanced breast cancer (ABC) compounds in development, breast cancer is a priority for Novartis. We also recognise that patient care is more than offering a treatment. For this reason, we call on our 30-year heritage and expertise as industry leaders in breast cancer to contribute to the progress of how women living with this disease are supported in their day to day lives. My Time Our Time is an ongoing campaign supported by Novartis that aims to raise awareness of the everyday realities for women living with ABC and bring to life the importance of their time, to help them feel valued and understood. 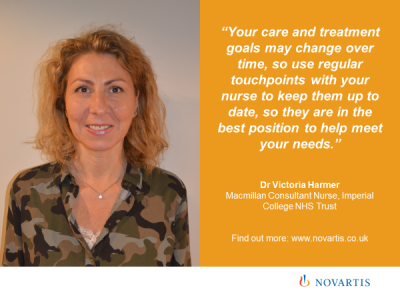 Novartis is proud to partner with ABC specialist nurses and women living with this challenging disease from across the UK, to share personal insights in to their experiences of ABC, as well as tips to the community to help support them in making the most of their time each and every day. What does time mean to you? Join the conversation using the hashtag #MyTimeOurTime and help raise the voice of women living with ABC. Watch this inspiring film to hear from Claire Myerson who shares an insight into life of living with ABC and her new perspective on the concept of time. 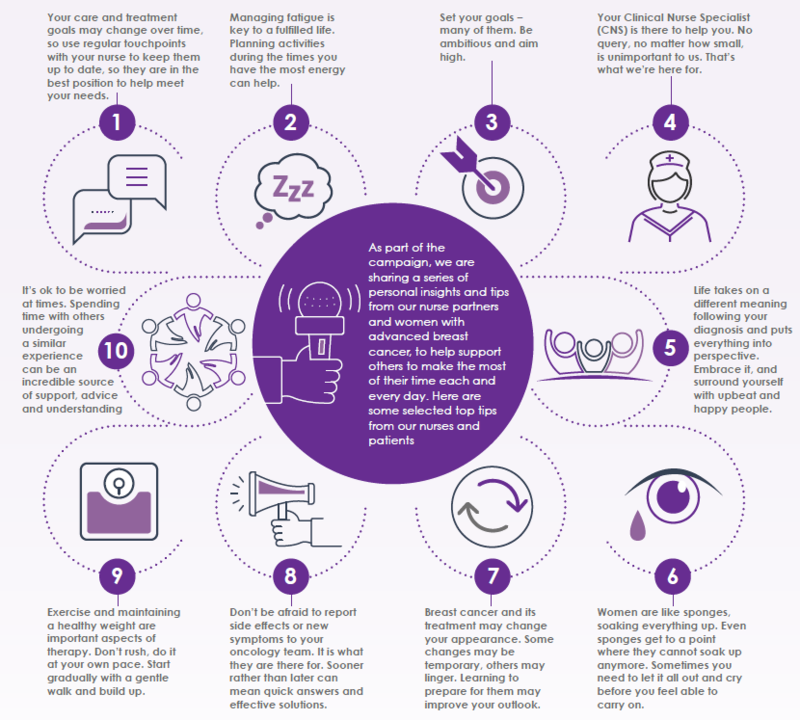 “Treatments for advanced breast cancer are varied and although living with uncertainty is always difficult - you must carry on and truly live your life. 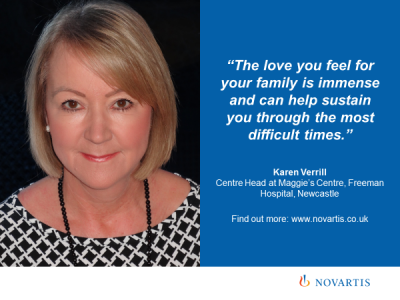 Karen has over 35 years’ experience as a nurse - 20 of these as a Breast Cancer CNS. For the last 5 years she has been managing the Maggie’s Centre in Newcastle, where people with cancer, their friends and family can gain practical, emotional and social support from specialist healthcare professionals. 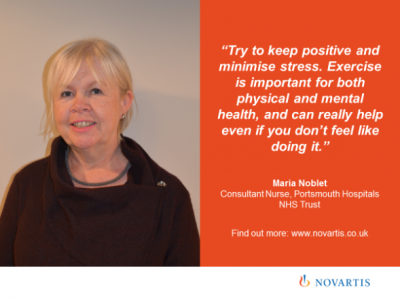 Follow Novartis UK on Twitter for more. How else are we supporting women with advanced breast cancer? Funded by Novartis, designed for people with breast cancer, SymTrac™ Lantern is a free iPhone app that helps people with breast cancer track their symptoms and the impact on their life over time. 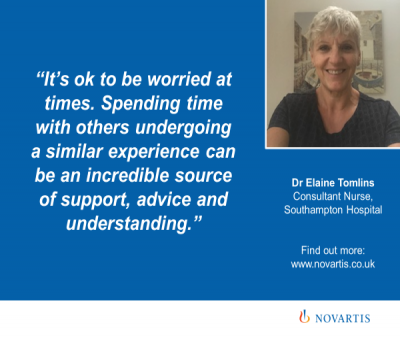 The data recorded can be viewed in easy-to-read charts and shared with oncology care teams to enhance consultation time and support decision making. Download the free SymTrac™ Lantern app for iPhone from the App Store here.